The global printed antenna market is displaying steadfast growth on account of high-value applications of printed antennas. The rising adoption of printed antennas in the aerospace and defense industry is catapulting growth of this market by leaps and bounds. This is because printed antennae in combination with radio frequency identification technology facilitates efficient data transfer needed in aircrafts, spacecraft, missiles for navigation and information sharing. Not only this, the cost effectiveness of printed antennae due to its easy fabrication using advanced printed circuit technology is fuelling their demand across several end-use industries. Apart from this, considerable research and development for improvement in printing quality and efficiency is further triggering the growth of this market. Printed antennas have substantial applications in telecommunications industry. These antennas form an integral component of several mobile communication devices thereby enhancing the data transmission capabilities of these devices. For example, the flourishing telecommunication industry in emerging economies such as India and China presents ample growth opportunities to the printed antennas market. 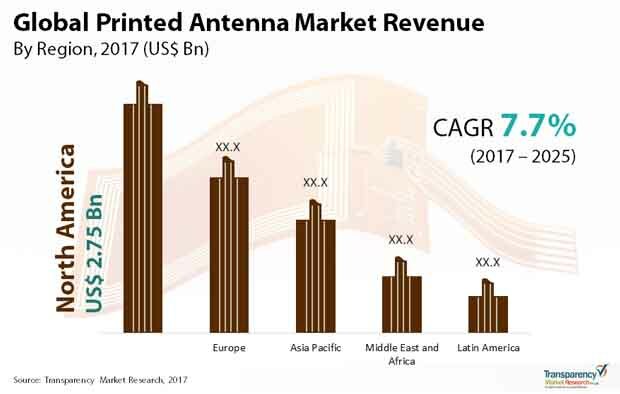 As per a report by Transparency Market Research, the global printed antennas market is poised to be worth US$12.87 bn by 2025 increasing from US$6.66 bn in 2016 at a CAGR of 7.7% between 2017 and 2025. The global printed antennas market is divided into five segments of ink-jet printing, screen printing, flexography printing, gravure printing, and others based on printing technology. The segment of screen printing leads the market in terms of value. Being one of the traditional forms of printing technology, screen printing is suitable for printing on large number of substrates such as plastic, paper, cellophane, and others. In addition, its application across several verticals and high accuracy outcomes adds to the advantage of screen printing. However, ink-jet printing technology is expected to rise at a considerable CAGR over the forecast period. Ink-jet printing supports digital printing and thus has rising applications across industries. Flexography printing is the newest form of printing technology and finds widespread application in military packaging and labelling. With the growth of the pharmaceuticals and defense sectors, flexography printing technology is anticipated to secure considerable market share over the forecast period. In terms of end-use, the segments into which the global printed antennas market is divided are automotive, telecommunication, aerospace and defense, pharmaceuticals, and others. In 2016, aerospace and defense held the leading share of the global printed antennas market. Printed antennae in combination with radio frequency identification technology extends efficient data transfer capabilities. The increasing use of printed antennas in the pharmaceuticals sector as an add-on in blood flow monitoring devices is expected to bode well for this end-use segment over the report’s forecast period. The key geographical segments into which the global printed antenna market is divided are North America, Europe, Asia Pacific, the Middle East and Africa, and Latin America. North America holds the leading share in the overall market on the back of increasing use of printed technology in defense sector that uses printed antennas for design of aircrafts. This, along with the growing investment in telecommunication and healthcare sectors is boosting the growth prospect of printed antenna market in North America. On the other hand, Asia Pacific holds immense potential to contribute to the growth of printed antenna market on account of rising penetration of mobile devices in the region. Some of the leading players in the global printed antenna market profiled in this report are Neotech AMT GmbH, Shure Inc., nScrypt Inc., Optomec Inc., Optisys Inc., Cobham plc, GSI Technologies, Mars Antenna & RF System, Thales S.A, and Texas Instrument Inc.
Market estimates for this study have been based on revenue being derived through regional pricing trends. The price for commonly utilized grades of printed antenna in each end use industry has been considered, and customized product pricing has not been included. Demand for printed antenna has been derived by analyzing the global and regional demand for printed antenna in each end use industry. The global printed antenna market has been analyzed based on expected demand. Market data for each segment is based on corresponding revenues. Forecasts have been based on the expected demand from printed antenna. We have used the top-down approach to estimate the global printed antenna market, split into regions. The product type split of the market has been derived using a top-down approach for each regional market separately, with the global product type segment split being an integration of regional estimates. Companies were considered for the market share analysis based on their product portfolio, revenue, and manufacturing capacity. In the absence of specific data related to the sales of printed antenna of several privately held companies, calculated assumptions have been made in view of the company’s product portfolio and regional presence along with the demand for products in its portfolio.